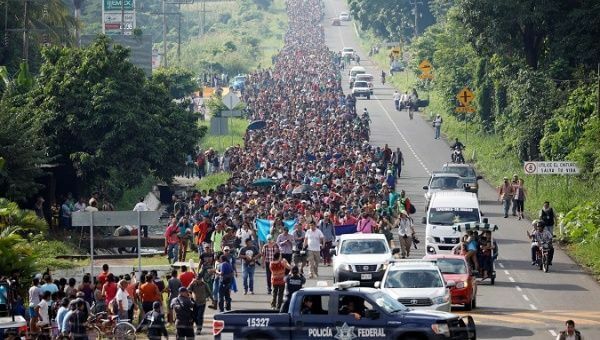 As everyone knows, there is an estimated 7,000 to 12,000 migrants headed to the U.S. southern border…let’s take a look at how this will affect America’s national security.This many people hitting one port of entry at once is going to cause problems on multiple levels. First, Border Patrol personnel will be distracted by the mass of people and have to focus additional resources toward them. This is going to take them away from other areas, allowing for entry of other illegal aliens, drugs, cartel members, and who knows what else.A group that large also provides a great place to hide for criminals and terrorists. If you don’t believe that terror organizations from across the globe don’t take advantage of situations like this then you simply don’t understand the level of sophistication that they possess. Something like using our open southern border to gain access to the U.S. barely requires a grade school level of planning ability. Our enemies are operating at a much higher level! President Trump ratcheted up his rhetoric Monday about a caravan of thousands of Central Americans making its way toward the U.S., even as uncertainty grew over what will happen to the migrants if they reach the border. Check out our news page for more SHTF and prepping news.